KUALA LUMPUR (December 19): The FBM KLCI has extend its gains for the third day today as bargain hunting has emerged after the earlier sharp drop on share prices. However, the benchmark index has ended the week slightly lower at 1,715.99 points, down 17 points or 0.98% from last Friday’s closing of 1,732.99 points. 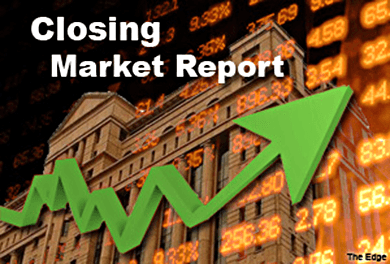 At market close, the index was 16.04 points or 0.94% higher against Thrusday's closing. Danny Wong, chief executive officer of Areca Capital Sdn Bhd, said that the KLCI had extended its rebound for the third day, after its downtrend. “Although the KLCI has staged a rebound, the index may still be volatile in the short term, at least until the global oil prices stabilise, if not rebound back to the previous levels,” Wong commented. He warned of a risk of a downgrade on Malaysia’s sovereign rating, in the case of an extended low global oil price environment over the next six months. Across the board, a total of 1.87 billion shares worth RM2.21 billion were traded. Market breadth was positive, with gainers beating decliners at 606 versus 257, while 277 counters were unchanged. The most actively traded counter was Minetech Resources Bhd, whose share price gained one sen to 10 sen with 91.3 million shares traded, followed by Sumatec Resources Bhd 64.2 million shares and Bumi Armada Bhd 38 million shares. Elsewhere in Asia, Japan’s Nikkei climbed 2.39%, South Korea’s Kospi gained 1.71%, while Hong Kong’s Hang Seng rose 1.25%. Reuters said that Asian shares enjoyed their best day in 15 months on Friday, after Wall Street boasted its biggest two-day advance since late 2011 amid relief the Federal Reserve was in no rush to withdraw stimulus from the US economy.